Never-Before-Seen, step-by-step home videos show you exactly how to build a business online -- Makes it incredibly easy for persons of all skill levels to start an Internet business! Registering a domain. You'll learn exactly how to register a domain (including WHERE to find the LOWEST PRICE for registration) and point your "nameservers" (don't worry, you'll learn what that means) towards your web site host. Setting up a hosting account. Speaking of your web site host, next you'll learn how to setup a hosting account. It's quick and easy when you WATCH how to do it on this special video. Note: You'll also learn where to get unlimited hosting for one low price. Creating a simple web page. Next up you'll discover how to actually create simple web pages to load to your new site. Don't worry, you don't need to be a programmer or understand HTML code. No experience necessary when you watch our two web page basics videos. Setting up an autoresponder. Everyone agrees that having your own autoresponder and mailing list service is CRITICAL to being successful online. When you watch our two "autoresponder basics" videos, you'll learn how to quickly launch your own automated message center. Automating your order processing. You'll also learn how to get your orders processed automatically by an independent third processor. This special video shows you how to setup an account and allow Clickbank to completely automate your order processing to take orders 24/7 without any work on your part! Download FIFTEEN videos below in this special, one-of-a-kind "watch it all" online training program! I'm certainly not a psychic, but I'm guessing that you'd love to own your own Internet business. ... from the comfort of your own home! ... less than 2 hours a day! And let's be honest, you'd have to be out of your mind NOT to want an automated business that brings in orders 24/7 while you sleep, play golf, read a book or take a vacation. To live comfortably - even extravagantly - while working a bare minimum amount of hours each week. Orders coming in around-the-clock and automatically fulfilled from a website without you so much as lifting a finger. Unfortunately, for most people, that "dream" is abruptly ended by an obnoxiously loud alarm clock at a time early in the morning when no one should have to be awake! And the reason it's just a dream is because somewhere along the way to wealth, no one explained HOW to get this online business started in the first place. Answer All Of Your Questions About Setting Up An eBusiness? My name is Jimmy D. Brown. I've been helping folks just like you start and grow Internet businesses since 1999. I've created over 50 products, tools and software programs that have helped tens of thousands of customers worldwide do just what you're wanting to do. If you visit Google.com, the web's largest search engine, and search for my name, you'll find almost a million websites that promote my products and resources. I don't say any of that to brag, but rather to let you know that I am very familiar with what it takes to setup and grow an Internet business. But, even I recognize that there is a "missing link." How can I upload files to my webpage? How can I let customers automatically download my product? How can I make more money from my site? How do I set up an autoresponder? How can I get folks to buy from me? I mean, you simply cannot setup a business on the Internet without knowing these (and other) basics steps. So, I decided that I was going to put together a course that answers these common questions (and a bunch more) that hold most people back from experiencing the "dream" of financial freedom. That way, you could have someone who's already done it time and time again, show you exactly how to do it yourself. I'd be answering your questions for you ... before you even asked them. So, that was my plan. He Took My Idea And Left Me Standing In His Dust! I'll admit it. I got busy with some other projects and totally forgot about putting together the course to answer all of your business startup questions. I was talking with my good friend and co-author, Ryan Deiss, about how I needed to take a month or so off later in the year to create some video tutorials to walk my clients through the basics of setting up an Internet business. I just casually mentioned that I really wanted to put together a set of these videos to actually show my clients exactly what they need to do in order to get their own Internet business up and running. And guess what that turkey did? Yep, you're right ... he beat me to the punch! I got a call from him just a short bit later and he told me that HE had taken the time to create a set of video tutorials ... "Internet Business Basics." At first, I was taken back a bit. Did he really steal my idea here? Imagine my relief when Ryan told me that he was going to allow me to make them available here at this very web site so folks like you could really get the inside track towards fulfilling your "dream" of making money online. After *literally* months of discussion, I finally talked Ryan into allowing me to obtain an exclusive, worldwide marketing license for this impressive video collection. We worked out a special deal and I am proud to make available here for the very first time ever, the Internet Business Basics Video Tutorial Course. 15 Digital Videos You Can Watch Online Or Download To Your Own Computer! You'll be able to immediately download well over 2 hours of video training tutorials in the Internet Business Basics package! How to choose a domain name for your online business. How to actually register and protect your domain name. Where to find the absolute, cheapest domain name registrations online. How to make certain your web site is "live" for others to visit. How to set up your first hosting account. How to find a web host for under $6.00 per month or load as many as 200 different sites for under $20.00 per month. How to setup a completely free autoresponder account. The importance of message sequencing and how to setup your outgoing messages. How to setup automated follow-ups and what intervals to use. How to broadcast your solo mailings and newsletter issues. How to create an "opt-in" form for subscribers to use in automatically joining your lists. The importance of multiple autoresponder accounts and lists. How the sales process works to produce orders at a direct response web site. Ryan really reveals it all in these fifteen videos. 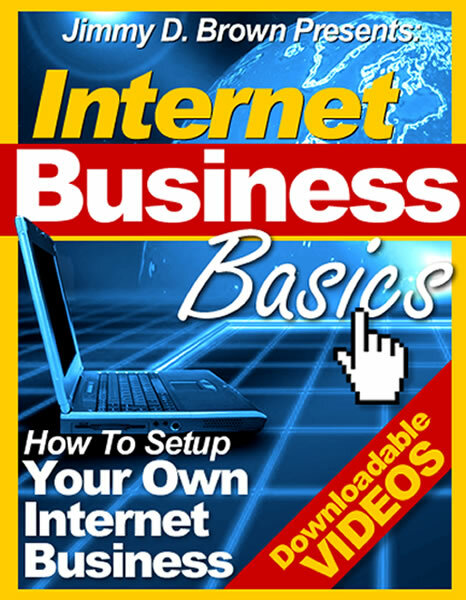 He covers, quite literally, every step of the process for setting up your own Internet business. If you do not already have a product to sell, then I recommend you check out "Resale Rights Section" by Clicking Here. The 2 pages that 90% of the web sites don't use that are absolutely critical to Internet profits. How to create a simple webpage even if you don't know HTML. How to create and edit webpage links - both those that open in the same browser window and those that open in new browser windows. How to import graphics and change font styles, sizes, colors, etc. How to create "intermediate order pages" and "customer capture pages." How to setup a download page for automated order processing. How to create download links and the exact instructions you need to provide your customers with to reduce support requests. How to setup a Clickbank account and get it approved for order processing. How to setup an automated order processing system. How to upload all of your files to your site using FTP. Where to download the absolute best FTP software for free. How to obtain the server information you need to upload your files. Ryan covers *literally* everything you need to know in order to setup your own Internet business! You get 15 downloadable videos (over 2 hours of tutorials!) that walk you through every step of the process. I only wish these videos had been around when I was starting out. It would have saved me many long nights of frustration trying to figure it out on my own! I had to learn everything by "trial and error" ... but you don't! You can save yourself months of time! Why spend the next weeks and months trying to figure out all of the steps it takes to get things going online, when you can have a detailed, step-by-step training course walk you through it all from beginning to ending, in logical steps? You can avoid costly mistakes! Why risk making mistakes that force you to start all over again (or worse yet, spend more money!) when you can have an expert who has done this dozens of times show you how to get it done right the first time? You can watch instead of read! Why read another ebook that "tells" you how to do it -- and then you've still got to figure out how to do what you've been told! -- when you can watch someone show you exactly how to take action and get your business up and running today? You can learn at your own pace! With these videos you can pause them, rewind them, fast forward them, jump to whatever step you want, anytime you want! It really is the ultimate way to learn. Here's the thing: these action steps aren't optional. You simply MUST do them in order to setup an Internet business. You might as well learn how to do them right from the beginning. This is the quickest, easiest way that I know of to get your new Internet business setup. Tell you what ... I'll completely take away your risk here. Order the videos below and take a full 90 days to watch them. That's right, take the next 3 months to watch these videos and try them out for yourself. And if you aren't completely satisfied after 90 days of using these fifteen videos, simply email me and I'll promptly refund your entire purchase amount. I am so confident that these videos will teach you exactly what you want to know about setting up your own Internet business, that I'll give you a full 90 days to decide for yourself.